If you have time it would be interesting to hear the details. So if the black line with squares is away from the dashed line by 5 sigmas that’s not the same thing as a 5 sigma discovery? Yes – that is correct. The reason is that those two numbers are answering two different questions. 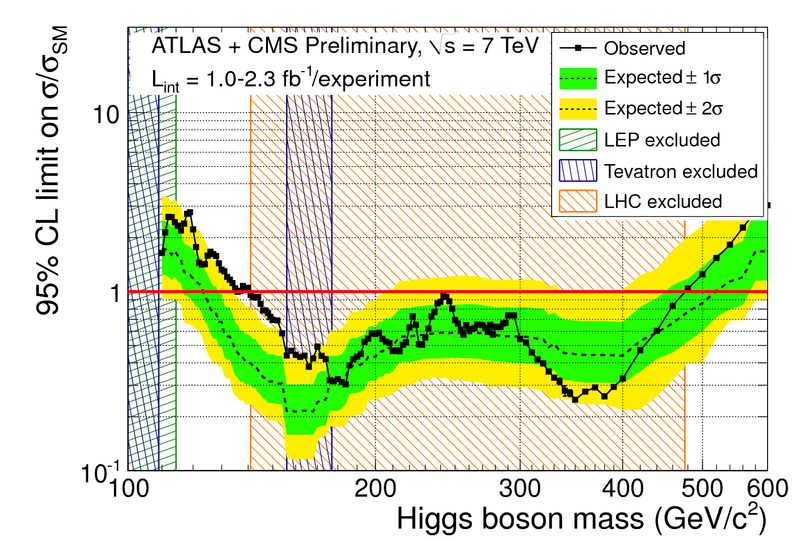 If the first case (the limit plot you are looking at) you are asking if you rule out the Standard Model, basically – so you are including uncertaintys on the Higgs boson cross section (given its mass) – that come from theory, say. In the latter case, just the number, you are saying “well, I have no idea what the higgs boson cross section is, I just know that it is at mass 140 GeV – so what are the chances the background could have fluctuated to emulate that 140 GeV?” – which is different. Now, in reality, the two should be very very close to each other. And if they aren’t then you need to ask some questions. 🙂 So, this is a minor point and shouldn’t distract from the actual message, though it is a real point. Hi, Gordon – thanks for the post! As background, I’m a UW torsion balance guy. Watching this week’s Higgs hoopla has been fun. One thing I find missing from the presentations is some sort of internal calibration of the exclusion plots. How can I check, by eye, if the analysis is done correctly? Put another way – I think I know how to eyeball data taken with minimal bias; I’m looking for a resonance that stands up and away from nearby background with obvious statistical significance. Is there anything similar that will let the lay-physicist tell that the background subtraction is roughly correct? Yes and no. It really depends on what channel you are searching in and it depends on how the data is presented. For example, the recent CDF dijet bump. In background subtracted form, the bump looks very convincing. But if you don’t background subtract it, you see it is on a sharply falling (huge) distribution. So what you want can fool you! In the Higgs case, a dijet mass bump will be very spread out, but a mass bump made up of di-muons or di-photons will show up very cleanly – this is strictly a function of the resolution of the objects that you are looking at (ok, the underlying backgrounds too, but that isn’t so relavent to this discussion). Many analyses now use multi-variate techniques – neural networks or decision trees. The point behind this is that there is more information in each event other than the di-jet or di-photon peak. Perhaps the boost of reconstructed Higgs, for example, is dramatically different when you have a real Higgs vs when you just happen to have two random photons in the event. In your race to be first, you’d be crazy to ignore that extra selection handle. There will be other handles. The problem is the output of an NN or a DT doesn’t look like a nice mass bump. Very hard to trust by eye – unless you’ve been working on the analysis – the NN or DT or whatever acts a bit like a black box. And these techniques are used at several stages in the analysis (i.e. how do you select a b-tag, how do you select an electron/photon, etc.). I hope this helps! Feel free to follow up. Fabiola’s plots are much closer to the sort of thing I was looking for.